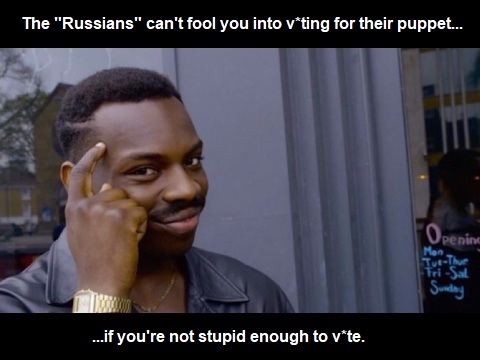 I am constantly amused by the concerns over "Russians" manipulating v*ters in the last (LOL. I wish) presidential election. If you v*ted for a ruler, it is clear someone manipulated you successfully. Why is it somehow "worse" if it was "the Russians" rather than Google, FOX, Facebook, or MSNBC? Propaganda and manipulation is the same whatever the source.